It is that time of year again, and anyone who works within the travel industry will be making their way to London’s ExCel for the World Travel Market 2013. A fantastic event where you get to met new contacts, establish business relationships, and catch up with old friends who live on the other side of the world, the World Travel Market attracts around 50,000 visitors each year, and they are all in search of the hottest travel destinations and the newest travel trends for the coming year. Showcasing more than 180 countries, the WTM is a truly amazing event, and while it is only open to those involved in the travel and tourism industry from Monday to Wednesday, the doors usually open up to students on Thursday, and you could even spot the odd celeb! 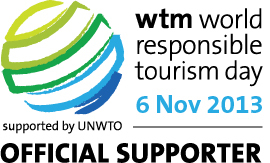 For us, the most important part of the WTM is World Responsible Tourism Day on Wednesday 6th November 2013, when leaders in travel and tourism come together to educate, inspire and stimulate year-round responsible tourism, and celebrate those who have made significant efforts in promoting sustainable tourism in the past 12 months. As official supporters of World Responsible Tourism Day for the second year running, we cannot wait to find out the latest news and developments, so watch this space for the latest travel gossip! Previous Post What are the Top 10 Holiday Destinations for 2014? Next Post Are These the Best Travel Jobs in the World?